Well, thanks to some automotive work I’m a bit behind on The Cask posts. The obvious solution is.... Double Feature! So today will be the first ever Double Feature Post, look back later today for another review! This review is for our last stop on the tour of Michigan Whiskey that was planned for March. Journeyman Distillery is based way out on the south western edge of Michigan in Three Oaks and I’m here to tell you that they are making some amazing whiskey. This is a true 100% wheat whiskey and it’s amazingly smooth. So what’s with the name? Well, the old factory they made a distillery out of used to be a Buggy Whip Factory. I mean, they had to make those somewhere, right? Pretty expensive when it comes to a The Cask Post, for everyone who recommends whiskeys to try, I love all the suggestions but remember I try to keep it below $40. 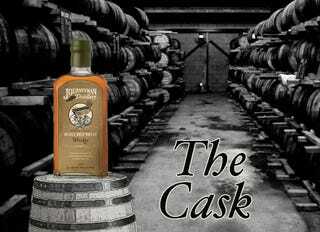 The theory is that there are plenty of Whiskey Blogs/Reviews that focus on the expensive stuff, The Cask aims to review affordable and attainable Whiskey. So this was a bit over budget, but I really wanted to round out March with another Michigan Whiskey. If you remember from the last edition of The Cask, here’s the way I do the rankings, 1 being the best. I’m telling you guys, I really liked this one. It’s smooth as can be with a great flavor, I definitely pick up the Vanilla in it. The only possible down side is the cost. That being said it SHOULD be amazing at this price. If I pay over $40 for a bottle and it’s not great, we’ve got a big problem. So that means we went 2 out of 3 for great whiskeys out of Michigan, and that’s not bad at all! Remember to stop back again later today for part 2 of our Double Feature! As always let me know what you think, what you want me to drink, and what you’ve been drinking! Have a great weekend everyone!